I have a confession to make. I am guessing it will come as no surprise to you, my 5 readers, that I have been feeling creatively challenged. Or maybe it’s creatively misdirected. Or maybe it’s creatively drained. Anyway, I’m certainly lacking in clarity and this is effecting my ability to create. Don’t get me wrong, I’ve been plenty productive professionally. I just haven’t been here writing. I haven’t been in my journal writing. I haven’t been scribbling little bits of nauseating poetry on napkins. In fact, I haven’t even written a grocery list in ages. I did however, find one in the parking lot of the local grocery store. The list had a little cherry sticker on it and ordinary items. I think the list maker was having salad that night. I hope they lost the list on the way out and not on the way in. I always find that to be frustrating, when I take the time to write the list and then misplace it. We all know how winging it in the grocery store goes. When I picked the notepaper up, I looked around to see if anyone was watching. It felt valuable to me. I picked it up, read it , shoved it in my purse, thinking it might inspire me to do something creative. But, I have since lost it. I thought I would write something about lost things and then I lost the thing. ha. I saw a snippet in passing on twitter or somewhere that writer’s block is a myth. Where was that? Ahhh, it was here on WordPress, writelarawrite. (She has made some lovely art to illustrate the point. You should check it out.) I didn’t really want to read it. I knew what was coming. I’m not creating because I am not creating. Simple as that, not because I had lost my need or lost the ability but, because I was being lazy. I thought I would just wait for inspiration and genius to strike. Hard work is involved? Commitment? Consistency? I, somehow thought loving it would make it easy. What the hell? Where did that come from? Aren’t I the mother of two teenagers, married for 20 years, sharing a home with a bull terrier? If you love it, if it’s meant to be, it will be easy. I have to laugh. How could I think it would just happen? It seems to be a recurring theme in pretty much any ‘I am successful at (fill in the blank)’ story. You have to put your time in, keep doing it until you get good at it, do it when no one cares or listens or reads. I’m here to write because I love it and because maybe other people get lost or lose things and they shouldn’t feel alone. So, I’ll just write and maybe you can find whatever your It is and then share it, with me. I feel the same way about badpony…. I thought it would be easy to make a living doing something you love. Not so, its hard and frustrating to be creative when you aren’t feeling it.. It is times like these when we must turn to the cliches & quotes. Wisdom of the ages: Anything worth doing is, blah, blah. Or I find going for a walk will sometimes clear the way for some inspiration & motivation. The doggies need collars, keep up the good work! Excellent. It is a topic I can really explore! Thanks for reading, Beth!! Thanks for the link! I wrote my post about Writer’s Block because I need a swift kick myself. May inspiration find us all. I’m not sure I realized that I needed a swift kick, until I read your post. So, thank you! You’re very welcome! Part of me thinks writers need a support group, but then that would be just another thing on my list of things to do besides actually writing. Ha. Yes, I have many support groups in mind, when really I should just help myself and write. Thank you for your kind words! In it together!! I enjoyed reading your post and the notes on your notebook actually made me bark out a laugh…so thanks for that too! You found my list! You have once more creatively inspired me to get a move on it. 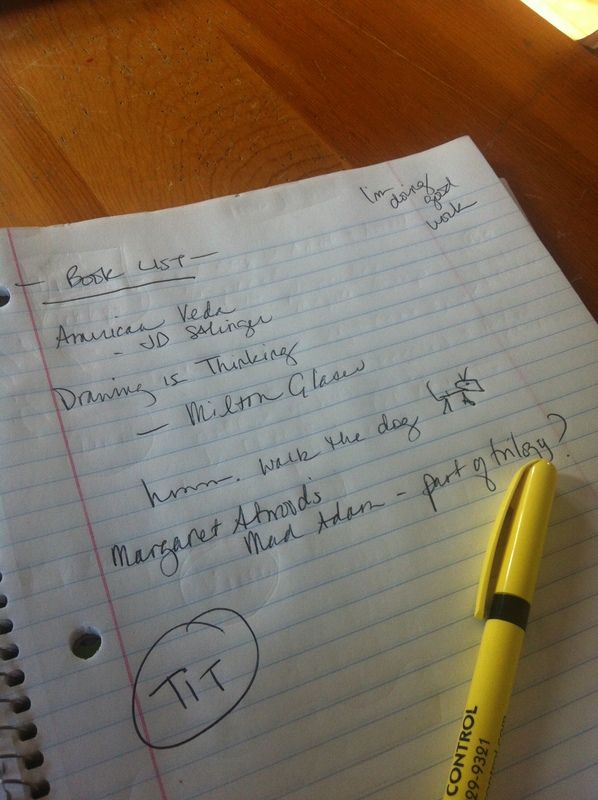 My journal hasn’t had entries in it for years……and I mostly forget the list that I so carefully add to all week. Please continue to write and inspire me….love your badass snowflake blog! !